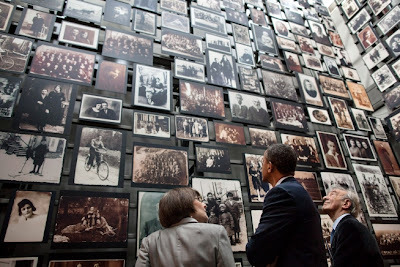 In a speech at the Holocaust Museum in Washington D.C., flanked by such Zionist luminaries as Elie Wiesel and Michael Oren, President Barack Obama referred to "those sacred grounds at Yad Vashem," the vast Holocaust memorial complex in Jerusalem. But considering the horrors of the Holocaust didn't occur anywhere near the grounds of Yad Vashem, one has to wonder what makes those grounds so hallowed. After all, Auschwitz is over 1,500 miles away from Jerusalem; Treblinka is nearly 1,600 miles away; Dachau is almost 1,700 miles away; Buchenwald is over 1,800 miles away. 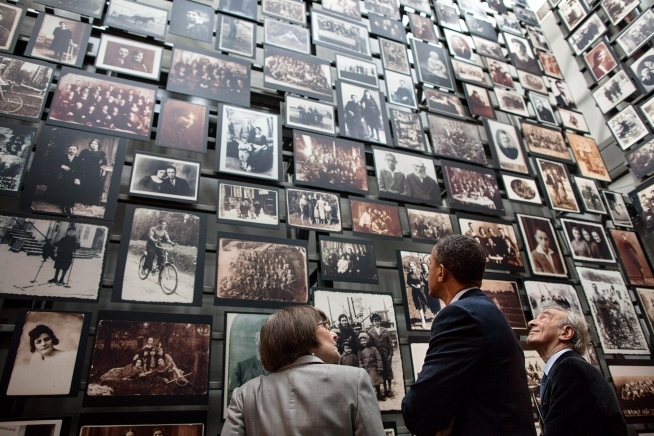 Do all Holocaust Museums stand on "sacred ground" just because of the subject matter they commemorate? If so, wasn't Obama himself standing on sacred ground at 100 15th Street SW in the District of Columbia? Will the ground upon which the Simon Wiesenthal Museum of (In)Tolerance is being built be sacred because of the museum, or because of the ancient Muslim cemetery it has uprooted and destroyed? Perhaps the grounds of Yad Vashem are sacred, though. Only a short distance away, within eyesight, is where Deir Yassin used to be before Zionist militias wiped it and its inhabitants off the face of the Earth. Obama spoke of atrocities committed upon countless innocents, "just for being different, just for being Jewish" and warned against "the bigotry that says another person is less than my equal, less than human." One wonders what he would say if confronted with the fact that the indigenous people of Palestine are deliberately, systematically and institutionally discriminated against, imprisoned without charge or trial, occupied and colonized, bombed and burned, shot at and under siege because they are not Jewish and because they refuse to forget who they are and where they come from, they refuse to acquiesce to the six and a half decades of ethnic cleansing, aided and abetted, funded, immunized and ignored by the nation Barack Obama now represents. Obama said that "'Never again' is a challenge to defend the fundamental right of free people and free nations to exist in peace and security -- and that includes the State of Israel." He mentioned Israel by name six additional times in his speech. Never once did the words Palestine or Palestinians cross his lips. He then proceeded to conflate Zionism with Judaism, present international law as anti-Semitic, and pulled a Netanyahu by warning of the looming specter of a caricatured Iran, one that exists only in the warped minds of fear merchants and warmongers. Said Obama, "When faced with a regime that threatens global security and denies the Holocaust and threatens to destroy Israel, the United States will do everything in our power to prevent Iran from getting a nuclear weapon." Obama also spoke of civilians "subjected to unspeakable violence, simply for demanding their universal rights," he spoke of "all the tanks and all the snipers, all the torture and brutality unleashed against them," and vowed to "sustain a legal effort to document atrocities so killers face justice, and a humanitarian effort to get relief and medicine" to those desperately in need. Obama praised those who "still brave the streets," who "still demand to be heard" and "still seek their dignity." He praised the "people [who] have not given up." He was referring to Syria, of course, and not to Bil'in, Ni'lin, or Budrus. 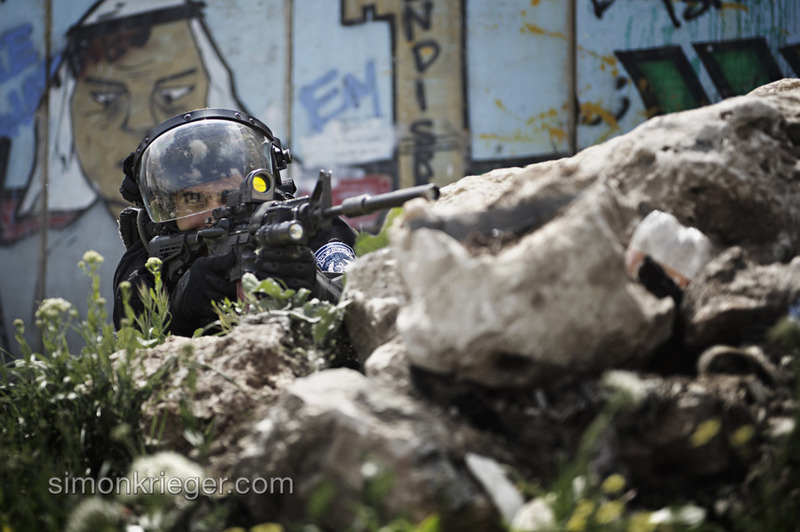 He didn't mean tanks in Gaza, IDF snipers who open fire on unarmed protesters and murder schoolchildren or the torture and abuse of Palestinians- including children - in Israeli jails. When he spoke of "unspeakable violence," the "humanitarian effort" and the "legal effort to document atrocities so killers face justice," Obama obviously didn't mean the devastation of Gaza by the Israeli military, the ongoing humanitarian crisis there or the recommendations of the Goldstone Report. Obama patted himself on the back for "sign[ing] an executive order that authorizes new sanctions against the Syrian government and Iran and those that abet them for using technologies to monitor and track and target citizens for violence." Of course, these sanctions were not extended to U.S. chums Saudi Arabia, Bahrain, the United Arab Emirates, or South Korea - all places where internet censorship is rampant and pervasive. Obama concluded by stating, "To stare into the abyss, to face the darkness and insist there is a future -- to not give up, to say yes to life, to believe in the possibility of justice" and declared, "If you can continue to strive and speak, then we can speak and strive for a future where there’s a place for dignity for every human being." He was speaking, rightfully, to the survivors of the Holocaust. But he was also, unwittingly and unwillingly, speaking for those who continue to struggle for equal rights, for universal rights, for dignity, freedom, sovereignty and self-determination, for justice long deferred in their own historic and ancestral homeland. He was speaking for Palestine. But don't tell Elie Wiesel. After quickly writing the above post (initially as an email to Phil Weiss), I was reminded of a speech newly-appointed U.S. Ambassador to Israel Dan Shapiro delivered earlier this year on January 27, 2012 at the Massuah Institute for Holocaust Studies in Israel in commemoration of the International Day of Remembrance for the Victims of the Holocaust and other Genocides. On this day, we remind ourselves that we cannot and must not ignore the stain of any genocide and mass murder on humanity. Because despite the declarations from the world after the Shoah that such horror shall be prevented we know that the world has continued to witness mass murder and genocide. Millions around the world, from Cambodia, Bosnia, Rwanda, Darfur, and elsewhere, have fallen victim to genocide and mass murder. These events do not just occur overnight. All genocides, all holocausts start, as did the Shoah, with the alienation, demonization, and marginalization of others. Before the gas chambers, there were mass shootings. Before the mass shootings, ghettos and concentration camps were established. Before the ghettos and camps, discriminatory laws were passed. And before the laws, anti-Semitism, racism and xenophobia flourished in public and political life unabated. And before that it was at the kitchen table, and in places of worship. That is why we have the responsibility to condemn the demonization of any group of people anywhere based on their race, ethnic origin, religion, sexual orientation, or other criteria. We have the responsibility to act against the forces of anti-Semitism, bigotry, and racism in any form. We must never allow another genocide to be perpetrated against the Jewish people or of any other people. And we must take seriously those who threaten such acts. While Shapiro's words, spoken in Israel at a time when the Israeli Prime Minister and his acolytes (including, at the time, many Republican presidential candidates) incessantly warn of a "second holocaust" if Iran were ever to build a nuclear bomb, were clearly meant to evoke sympathy with Israel rather than point out the stark hypocrisy of the Zionist State and the foundational lessons it says it learned from the horror of the Nazi Holocaust. Read again the bolded sections above, namely, "Before the ghettos and camps, discriminatory laws were passed. And before the laws...racism and xenophobia flourished in public and political life unabated." This is a snapshot of Israel right now. African immigrants and migrant workers are routinely discriminated against and the second-class citizenship of Palestinians in Israel is well-documented. Racist and explicitly discriminatory laws are passing through the Knesset with alarming frequency and ease. Leading Israeli rabbis routinely incite violence against Palestinians and encourage racist discrimination. Israeli apartheid and occupation in the West Bank and its collective punishment and constant assault on Gaza are exactly the kind of "demonization" (and worse, of course) that Shapiro mentions...it is based solely on ethnic origin and religion. If Palestinians were all Jewish, there would be no occupation. There would be no siege. Shapiro's words say it all. April 24, 2012 - In a letter sent to Israeli President Shimon Peres today in commemoration of the founding of the Israeli state, Barack Obama wrote that "based on shared values and interests, the bonds between our two countries are deep and strong." Though it's well-known and often brought up, Fascist Moldovan bouncer and child abuser Avigdor Lieberman, currently the Israeli Foreign Minster (and who, when he was Transportation Minister in 2003 stated his interest in busing thousands of Palestinian prisoners to the Dead Sea to drown them rather than releasing them), stated in 2006 that Israel's 1.25 million Palestinian minority population was a "problem" which required "separation." "We established Israel as a Jewish country," he said. "I want to provide an Israel that is a Jewish, Zionist country. It's about what kind of country we want to see in the future. Either it will be an [ethnically mixed] country like any other, or it will continue as a Jewish country." He added, "Minorities are the biggest problem in the world," and suggested the conflict would best be solved through more ethnic cleansing of Palestinians from their homeland because "the final result" would be "better." Following his comments, an aide to Lieberman attempted to do damage control but actually just got even more racist and Fascist: "Israeli Arabs don't have to go," he said. "But if they stay they have to take an oath of allegiance to Israel as a Jewish Zionist state." Of course, let's not forget the words of Rabbi Eric Yoffie, the outgoing president of the highly influential Union for Reform Judaism (URJ) last year in the Jerusalem Post. Writing on his blog, Yoffie recounted a conversation he had with a "rightwing Zionist" friend of his "[w]hile working with him to oppose the UN resolution on Palestinian statehood." Yoffie: I care about humankind, but I love my own group a bit more. I am more comfortable with them. I care more about them, just as I care more about my family than other families. Without a two-state solution, Israel will not longer be a state for my group; it will be a bi-national state without a clear Jewish identity. That is not the kind of place where I, or most Israeli Jews, will want to live. Rightwing friend: Are you saying you don’t want too many Arabs in the Jewish state? Yoffie: Yes, that’s exactly what I am saying. Yoffie added, "I don't apologize for my views because I don't apologize for Zionism. Zionism came into being to create a state in which a total Jewish experience would be possible — a place where Judaism belongs to the public domain and Hebrew is the language of everyday. This requires a large Jewish majority." He also declared, "I have fought for Israel my entire life. Perhaps someday I will decide to live there. And when that happens I want to be living among Jews. Not entirely, but primarily." In case anyone missed his racist point, Yoffie even titled the post, "I prefer to live with Jews." As Max Blumenthal has pointed out, Yoffie introduced Barack Obama at a recent speech the president delivered to the URJ in part by saying, "Our movement stands for openness and embraces pluralism." Well, apparently not the kind of pluralistic "openness" that might feature living next door to an Arab! With that in mind, statements made earlier this year by Israeli historian and ethnic cleansing enthusiast Benny Morris are illuminating. Regarding his hopes for the future, he wrote that "the Israel I want to see is more humane, more open, less religious and — to put it frankly — less Arab. I want less input from the ultra-Orthodox and from the Arab minorities." Morris also claimed that Palestinians in Israel are "intolerant" and declared that "if they had their way, would push Israel away from open, democratic, Western values." I swear I didn't make that up. Netanyahu echoed these sentiments earlier this month. Ha'aretz reported, "The State of Israel is doing 'not badly' compared with other countries, and, "if you deduct the Arabs and ultra-Orthodox from inequality indexes, we're in great shape," Prime Minister Benjamin Netanyahu told TheMarker on Wednesday in a special interview for the Passover holiday." "Being pro-Israel means...not pretending that there is no contradiction between being pro-Israel and being pro-Palestinian." Actually, though hand-wringers like Peter Beinart are loathe to admit it, she's exactly right. As Jewish ethnocentrism, exclusivity, and supremacy are obviously rampant (no, required) in Zionist ideology, it is no surprise that recent events in Israel (in supposedly "liberal" and "cosmopolitan" Tel Aviv, no less!) look and sound a lot like Ku Klux Klan rallies and calls for the ethnic cleansing of Bedouins is so mundane and banal in Israeli society that it's considered an issue of "real estate"! Just today, CBS News reports that former IDF chief of staff and Defense Minister Shaul Mofaz, who was born in Tehran, immigrated with his family to Israel when he was nine years old, and last month won leadership of Israel's so-called centrist, opposition Kadima Party, told Israel Radio, "The threat of us losing the Jewish majority and Israel becoming a binational state is the biggest threat to Israel, and time is working against us." He added, "The threat of a binational state that we are bequeathing to our children really keeps me awake at night." Talk of "demographic threats" or "demographic time bombs" is hardly democratic and most certainly racist. Israel can only exist as a "Jewish" state with "perpetual socio-ethnic engineering." As Yousef Munayyer wrote in early April, "there is nothing worth saving about an ideology that makes a state fear the wombs of its citizens." In mid-January 2012, The Guardian reported that "Israel's supreme court has upheld a controversial law that bans most Palestinians who marry Israelis from living inside the Jewish state." The court apparently agreed that "Palestinians who gain Israeli citizenship through marriage pose a security threat." This law purposely prevents thousands of Palestinians from living with their spouses and families. In perhaps one of the more appalling quotes of all time, "Justice Asher Grunis wrote in the majority opinion that 'human rights are not a prescription for national suicide'." It's heartening to see that Amb. Shapiro respects Newton's laws: actions generate reactions, and A comes before B. He warns that ""Before the ghettos and camps, discriminatory laws were passed. And before the laws...racism and xenophobia flourished in public and political life unabated." Now, if he can bring himself to acknowledge that BEFORE there was "racism and xenophobia and laws . . ." in Germany, there was the deliberate and illegal starvation to death of 765,000 German civilians by Allied blockade that persisted from 1915 until 1919 -- almost a year AFTER Germany had surrendered. Allies maintained the blockade, and more German women and children died of hunger, to force Germany to sign the Versailles Treaty, whose terms imposed crippling reparations on Germany and declared that Germans bore sole responsibility for the war. And Edwin Black wrote in "The Transfer Agreement," "[M]ajority Jewish sentiment won out at Versailles, assuring a Jewish homeland in Palestine, with stipulations preserving Jewish rights in other countries. American Jewish Congress leaders returned from Versailles in triumph." In other words, just as Palestinians are called upon to bear the burden of the European sins against Jews, Germans were called upon to pay the price of Rome's sins against Jews. Simultaneously, as the Yad Vashem website explains, Jews emerged as the architects and managers of the Weimar government, which key German leaders feared were antithetical to the culture of the German people, and which also failed to support a sound economy for Germany, causing yet another round of starvation deaths. You've made some progress, Amb. Shapiro; now tell the rest of the story: what is called German "racism and xenophobia" was a starved and outraged people's reaction to years of deliberately and illegally imposed suffering. In view of the sanctions deliberately imposed on the Iranian people, this is an extremely important historical lesson to be learned -- if we really mean "Never Again."